Would you make a two-day investment to reduce your design time by 60% and improve measurable learning and retention by 50% or more? Apple, Intel, AT&T and others have gained measurable learning results through these concepts. Learn by doing and take tangible results with you. In this workshop, you will do more than just gather information. You'll be working with one or more of your key training programs and transforming them into effective, learner-centered, and totally engaging A.L. sessions that produce superior results. You will also have the opportunity to share your creations with the class and solicit valuable feedback. The Accelerated Learning Handbook and The Jiffy Guide to Effective Knowledge Transfer are both included with your registration! Dave Meier founded The Center for Accelerated Learning in 1980. Since then he has prepared more learning professionals than any other person worldwide, and he brings with him a perspective and depth of experience you'll find nowhere else. He is the author of the bestselling Accelerated Learning Handbook, and he has worked with hundreds of top organizations in North America and worldwide to liberate training from its industrial and mechanized origins and to make it more humanistic and effective for learners in today's world. Tom Meier is Co-Director of The Center for Accelerated Learning in the US and Worldwide. 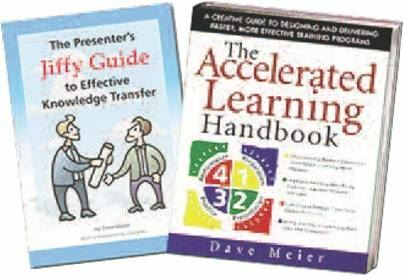 He is author of the Accelerated Learning CourseBuilder rapid design kit and AL on Deck, together containing over 500 ideas for getting learners totally engaged in their learning. He has facilitated both face-to-face and online courses and designed courses for major organizations worldwide. His passion is creating environments and situations that help participants learn at their best. Cancellation/Refund deadline is April 1.